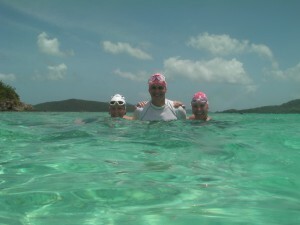 Thursday has become a traditional hike to Waterlemon Cay for a swim during TriathlonSkills/Total Immersion Open Water Camps on St John in the USVI. It starts with getting there. It’s a one mile walk on the Leinster trail, leaving from the Annaberg Sugar Plantation ruins. This relatively flat trail follows the shoreline ending at the Waterlemon Cay. 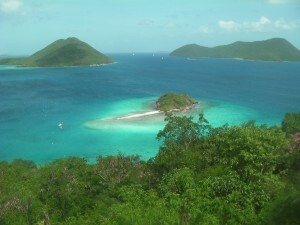 Once on the sandy, scalloped beach, which is typical of StJohn beaches, a few people will hang their bags or packs before continuing the short climb up the Johnny Horn trail for more views of the British Virgin Isles. From the ruins of a house, from the sugar plantation boom, are some spectacular views. From these ruins is a spectacular and inviting view of Waterlemon Cay, which is our swim for the day. Once back down on the beach, pods of swimmers form to make the casual swim around the Cay, just shy of a mile distance round trip. This has become my favorite swim as a group because it is what open water swimming is really about for me. It’s social swim as we form pods of swimmers who will swim together. It’s adventurous because we are going over coral reef and one never knows what nature has in store on that day, in that moment for us to behold. (Sighting a turtle as it magically and effortlessly drifts through the water is always a treat!). The same can be said for the changing condition of the water…calm in the protected area of the bay, a little more “sporty” around the top of the Cay then a little more mix of wind and current over the back side, before returning again to calm waters as we slip back into the bay. There is no instruction on this day, unless requested, as we swim for the pure enjoyment of moving in harmony with the water and with each other. It’s a day we swim with one another for the pure enjoyment of swimming in a beautiful place, without physical boundaries of a pool wall, with friends, and that infinite connection to and with nature. See yourself swimming here with us in 2014! It’s as beautiful as it looks! This entry was posted in Blog, Swimming. Bookmark the permalink.